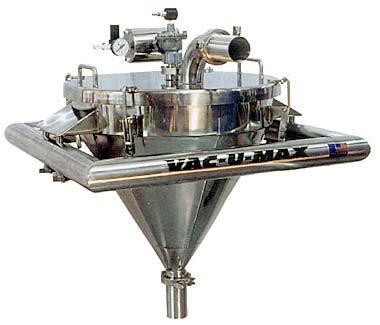 A unique adaptation of vacuum transfer is "direct charge blender loading," when a vacuum tight process vessel becomes the primary vacuum receiver for material being charged into it. 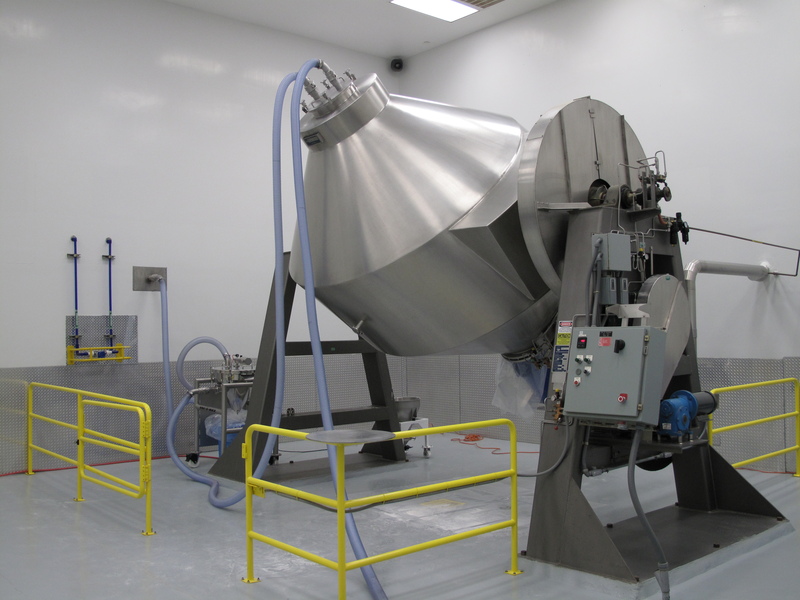 Eliminates carryover of product from blender, insuring batch integrity. For use with blenders having a minimum 10 cu. ft. capacity. 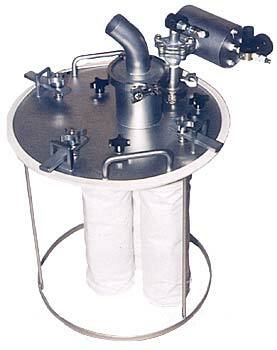 Includes 19" diameter cover, clamps and three, 6" diameter X 16" long filter bags in various material types. Standard feature includes quick disassembly for easy cleanout. Camlock-type fittings and dust caps are optional. Material outlet available in 2" to 3" diameter range. Cover adapter must be removed before blending and replaced with standard cover. Multi-filter cover adapter also available with vacuum outlet only. Can be used with standard VAC-U-MAX material inlet on opposite side. 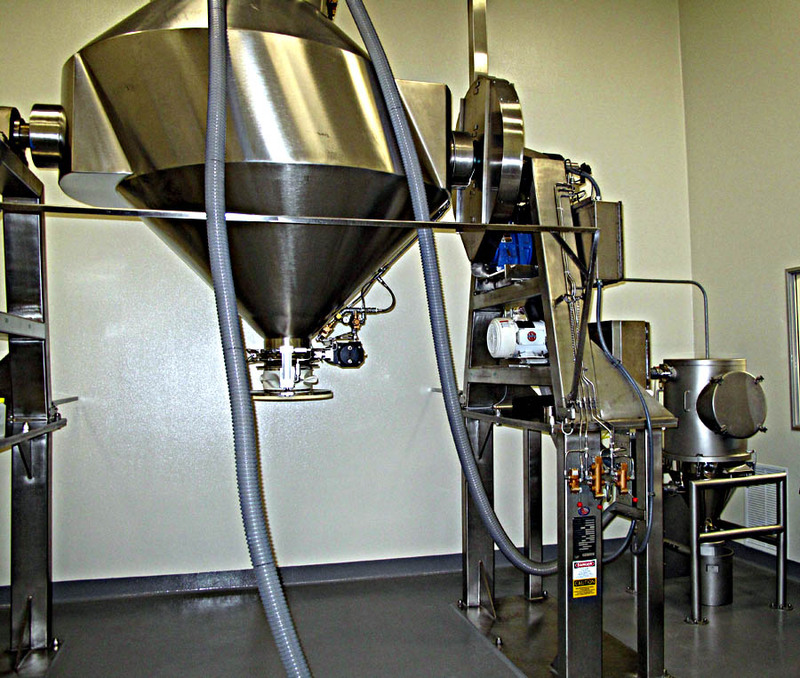 Except for certain materials, both eliminate need for separate blender loader system. Also available are standard cover adapters without built-in filters. Select from four configurations of one or two tubes per cover. Tube diameters range from 1.5" to 4" and come with plain tube ends. 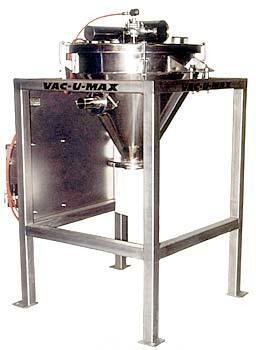 The following accessories have been developed by VAC-U-MAX to facilitate the direct charge loading of a blender, mixer or other vessel capable of withstanding a vacuum. They offer convenience, efficiency and greatly improved housekeeping. The dummy hose station prevents damage due to accidental starting of blender or mixer while hoses are attached. It also affords a safe and convenient storage place for hoses when not in use. Comes with 316 stainless steel Camlock-type adapter, NEMA 12 limit switch and mounting bracket in 304 stainless steel bead blast finish. Available in 1.5", 2", 2.5", 3" and 4" adapter sizes. Reduces or eliminates wearing by abrasive material at blender inlet. Also prevents high speed impacting of this material on blender interior. 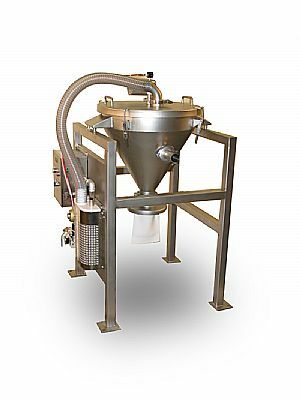 Eliminates the conventional vacuum receiver, its loading and discharge .Transfers all the material into the process without spills, waste. Keeps housekeeping to a minimum. Transfer can be completely automatic, eliminating the manual handling of the material. 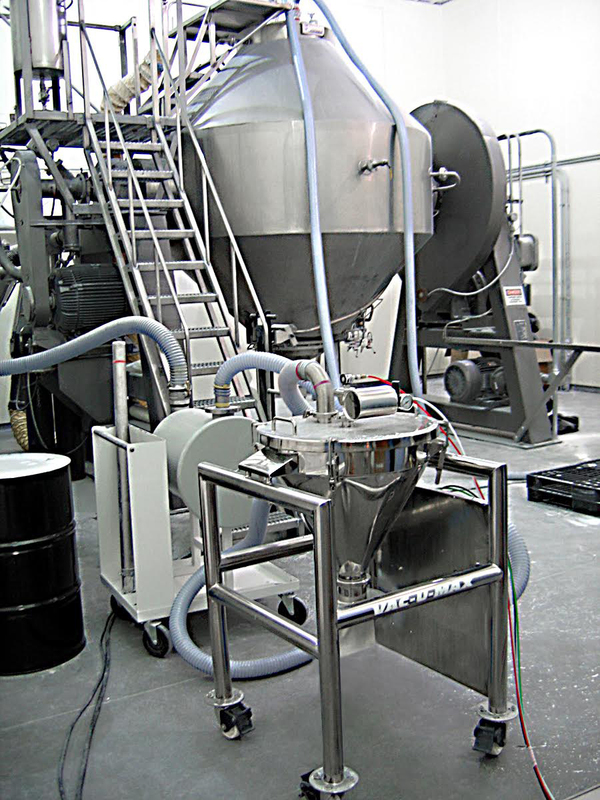 Avoids product waste, loss and contamination. Material is drawn from floor level through clean hose or tubing. Operating personnel are not exposed to dusty or harmful material. Systems are packaged with timing controls and automatic pulse filter cleaning. Controls and vacuum pump can be remotely located. Blender loader hopper is easily removed from frame for washdown, leaving controls and power components in place. Blender cover modifications are routine, or standard adapters are available for many models. Complete range of pneumatic accessories include pick-up wands, feed bins and bag dump stations. Power options include VAC-U-MAX vacuum pump packages from 3 hp up and the exclusive ,VAC-U-MAX venturi power unit. Available standard in 304 stainless steel and 316 stainless steel. Food and pharmaceutical grade finishes available.